LG devices are one step forward in receiving Android Marshmallow OS. After the Google Nexus devices, LG G4 is one of the devices which got Android Marshmallow update via OTA. The users of LG G4 were waiting for this latest OS, after rolling out this Marshmallow update via OTA many of LG G4 users got this update. You should have also updated your LG G4 (H818P-Dual) to the latest Marshmallow OS. After rolling out this latest Marshmallow update thousands of LG G4 users got this update. All you know this Marshmallow OS is an early stage and have some issues and bugs too. So after going on Marshmallow all the LG G4 owners was not fully satisfied with the performance of Android 6.0 Marshmallow. Many of the LG G4 users want to go back to the previous version of Android 5.1.1 Lollipop. So stay with us and easily Downgrade LG G4 H818P (Dual Sim) from Marshmallow to 5.1.1 Lollipop. The main reasons to downgrade from Marshmallow to Lollipop are some bugs and issues having this new Marshmallow OS. This Marshmallow OS is an early stage and developers of Android Marshmallow trying to remove all the bugs and issues from this update. Followings are the issues and bugs which noticed in this update. Many of the LG G4 H818P users found the battery drainage issues, Android Marshmallow has a special app named Daze for batter battery life but it needs an update version for working properly. This is now not very successful now. Some other issues are given below. Some apps are not 100% working on this latest Marshmallow OS. New updates of Applications receiving very late compared to the previous Android version 5.1.1. Many of LG G4 users reported that new Marshmallow update fails to complete, due to insufficient space or some other issue. This creates problems. Almost every of LG G4 user reports that it fails when they are sending an MMS to someone. It either fails or not properly received to the other person. After going on Marshmallow we seem much time about random reboots, smartphone turns off while using. Some users reported that WiFi and Bluetooth options are not properly working using Marshmallow. So let’s move to the real topic, this Marshmallow update is an early stage and is not much stable for this great device LG G4 until the new upgrade version arrives. Till then if you want to go back to the previous OS then follow this guide. The downgrading process is not very difficult. Thanks to the LGUP tool which makes this process very easy. 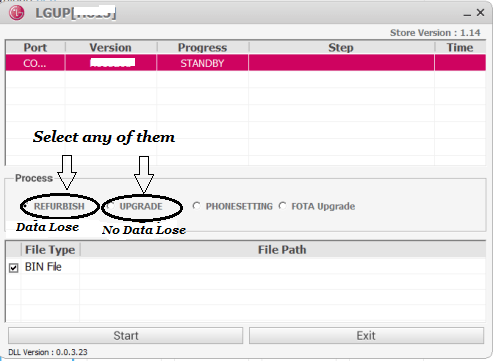 LGUP is a new tool for updating and downgrading the LG devices. This tool is much easier then LG official tool. LGUP is specially made for Marshmallow because LG official tool didn’t word properly on Marshmallow. LGUP is using for flashing the KDZ file. Using this tool there is no need to boot into download mode for flashing the KDZ file. The use of LGUP is much easier than any of the other flashing tools. If any of the user who have a little knowledge he can easily downgrade or update their LG device without having any problem with the help of LGUP tool. This downgrading process is only for LG G4 H818P (Dual). Do not try this on any other variant, model or smartphone. Do only if you are an advanced user, if something went wrong during or after the processAndroidfunz.com will not b responsible for damage or bricking your device. If your LG G4 is rooted, you will loose your root access after going on previous 5.1.1 OS. Backup all the important data on your device like pics, apps, messages, contacts, important passwords, movies, and accounts, if something wrong happens you may lose your precious data. Charge your LG G4 fully before starting the process to avoid the power issues of the device during the process. Download LG USB drivers on your PC. Properly working USB data cable. Down LGUP flashing tool from HERE. After downloading launch the LGUP tool. Connect your LG G4 to PC via USB data cable, if properly connected LGUP will detect your device, it will b listed on the LGUP screen along with the model number of your LG g4. 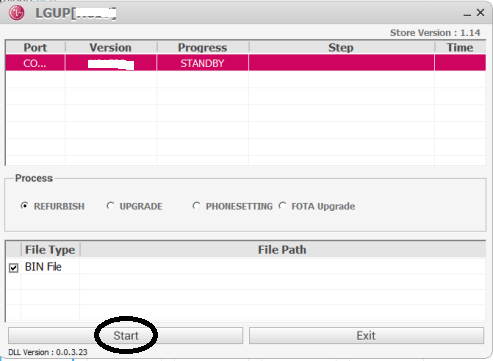 Click on the Upgrade option, choose file path, there select KDZ file which we have downloaded early in Step 1. After selecting the KDZ just click on Start button. It will start KDZ flashing process. It will take some time. After the firmware installation completes your LG G4 will automatically reboot. 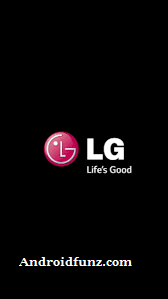 How to Fix LG G4 Stuck on Boot screen or LG Logo. Hope you like our tutorial, if you have any issue let us tell in the comment menu.